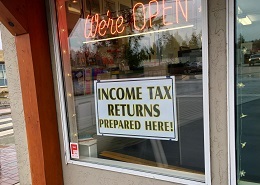 We prepare business & personal income taxes here! Yes, Nel Burger is preparing taxes in Sooke! With 35 years’ experience, Nel can help you get the job done right. For more details, visit us at 1-6649 Sooke Road…on the roundabout! Yes, we make lawn signage! Printed signs measure 12×18 inches and can be single or double sided in full colour. Metal stakes ARE included. No minimum order, volume discounts available. Need design assistance? We can do that too! Visit us at 1-6649 Sooke Road….on the roundabout! It’s TAX TIME! We sell paper by the ream ~letter and legal sizes! Have old paperwork to dispose of? Use our confidential shredding services ~ $1.50 per pound. Need to store files? We sell bankers boxes too! Visit us at 1-6649 Sooke Road….on the roundabout! Our 2019 custom gift catalog is here and it’s full of cool stuff like bamboo cutting boards, coffee mugs, puzzles and more. Email us for a catalog or visit our Facebook page for more details. Orders accepted by email! *Most custom gifts are available year-round! Save with PREPAID shredding bags! We now sell PREPAID shredding bags! Purchase a paper bag for $10 plus tax, fill it then return it to us for shredding. Bags hold approximately 10 lbs, (regular price $1.50 per pound). Get yours at 1-6649 Sooke Road…on the roundabout!